After the events of ‘No Way Out’ (Volume 14) the community is trying to rebuild itself and look to make itself stronger for a safe future that Rick really wants for Carl. Will Carl see that future though? He’s in a coma and showing no signs of waking up. There are also ominous rumblings from longer term residents that the arrival of Rick and his band has spelt nothing but trouble for them. They were safe before but now they’re dying at a tremendous rate, Rick and his friends have to go... one way or another. Long term readers of the ‘Walking Dead’ series will notice that there’s a well-defined pattern to how the story plays out. Rick and his friends get settled, start to make a life for themselves and then it all comes crashing down in a series of violent events that will leave at least one main character eaten by zombies. Pieces are picked up and the whole thing starts all over again. This is very much what ‘We Find Ourselves’ is, a transitional piece where everyone gets a chance to take a breather before they start again. This time though, this approach doesn’t work nearly as well as it has done in the past. The bottom line is that there is no real sense of danger to give the plot any urgency whatsoever. In the past, transitional books have been driven by the fact that zombies are still out there, often quite literally snapping at the heels of the survivors. 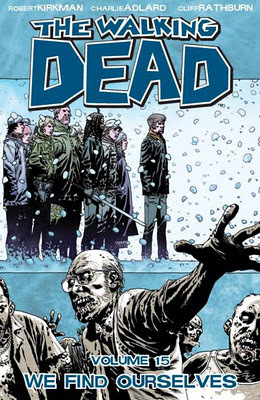 Rick and his band have to find shelter before they can begin to recover. This time, the gap in the wall is filled in and... That’s pretty much it. A small group of zombies is picked off with almost contemptuous ease and the one or two others encountered have been frozen, its winter, so can be picked off even more easily. You’re probably thinking that’s ok though; after all we have a rebellious faction within the community itself that should make for an interesting turn of events. That rebellious faction has potential but this is wasted by the fact that Kirkman not only uses them too soon but clearly doesn’t give them a brain cell to share between them all. They are also taken care of far too easily (having never really had to fight for survival like Rick and his friends) and the status quo resumes too smoothly for my liking. The story really needs the walls of the community to come crashing down, in order to spice things up, but at the same time the logical step for the survivors is to make those walls even stronger so they can settle down and live. It’s an interesting conundrum for the series and one that suggests to me that the ending can’t be too far away now, however it turns out. In the meantime, Rick’s introspection (and having to rebuild his relationship with Carl) doesn’t quite balance out the fact that nothing is really happening here. I get that you can’t have zombies all the time but you’ve got to replace it with something that keeps the story vital and interesting. There’s very little of that here; just hints for the future that don’t match what has gone before. ‘The Walking Dead’ hasn’t let me down, on the whole, so I am more than willing to be proved wrong as the story continues. Right now, things just felt a little lackluster (including the artwork), like the story was just marking time instead of actually doing something. That doesn’t bode well for the future but, like I said, I’m willing to be proved wrong.